I am a fourth generation Psychic, Medium, and channeler. Intuition and psychic dreams have always provided me with guidance and prediction for myself and others, as well as world events such as the US presidential ballot fiasco of 2000 and psychic dreams about 9/11, twenty years prior to the event. My grandmother was a devout faith healer in a small village in Italy. My great uncles were profound automatic writers, a form of mediumship, and well known authors of their time. I am grateful to have this family gift. I continually refine my abilities through teaching, yoga, meditation, psychic development courses, seminars and healings. I offer psychic readings as well as private tarot classes. My purpose in a private reading is to give individuals the information that best serves them as guidance in their present and future endeavors, as well as understanding how the past has led them there. In a typical session, I share what I see for the client, and later in the session discuss individual topics more in depth, opening the reading to question and answer. Readings can be a helpful way to look at our most likely future path and guide us towards our full potential. We should always be aware that free will is available anytime we wish to change the path, or go in a new direction. 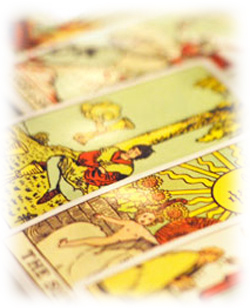 Psychic readings can benefit us by offering a helpful energetic forecast for both the present and long term future. I primarily use tarot cards in private sessions and practice psychometry, palmistry, along with some mediumship and past life readings. A reading is best when the client feels they can focus on the information they receive in the session instead of feeling rushed. I usually leave the open hour, even for shorter sessions, so that a client has the opportunity to extend the length of their reading during the session; should they desire more time. Readings can be done in person, by Skype or by phone. The energy is the same regardless of where you are. It all depends on your preference.